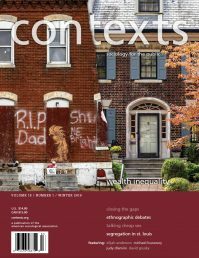 Given our current age of “alternative facts” and “fake news,” moving sociological research into the hands of a wider audience has taken on added importance. And while the discipline has seen vigorous debate about the role and value of public sociology, I have begun to consider how to actively awaken my fellow citizens to what C. Wright Mills described as understanding one’s personal troubles within the context of the sociological imagination—particularly with respect to the dynamics of American poverty and inequality. With my colleague at Cornell University, Tom Hirschl, I have published over the years a myriad of academic articles and books on this subject. But how might this research begin to better inform and change the public’s awareness and perceptions of poverty and inequality? Could raising others’ consciousness impact how, we as a nation, address these issues? Much of our research has focused on understanding the life course risk of poverty. Using the Panel Study of Income Dynamics (PSID) data to examine hundreds of thousands of cases over a 45-year period, we have shown that the lifetime chance of poverty for many Americans is significant. In fact, the majority of Americans will experience at least one year below the official poverty line at some point during their adulthood. As I considered this finding, I had an idea. What if we could use this body of research in developing a tool that would allow individuals to estimate their own risk of poverty in the next 5, 10, or 15 years? I was, at that point, beginning to think along the lines of the heart disease calculators widely found across the Internet. Based on longitudinal data from the Framingham Heart Study, these calculators let people input basic health and background information, and then use the data to determine their risk of a heart attack in the next 10 years. Why not develop something similar to predict the risk of poverty? After literally hundreds of hours of programming and designing, we have created the website, “Confronting Poverty: Tools for Understanding American Inequality,” and the tool, the poverty risk calculator. Poverty Risk Calculator as found at confrontingpoverty.org. I believe this represents a radical extension of the concept of public sociology in several ways. 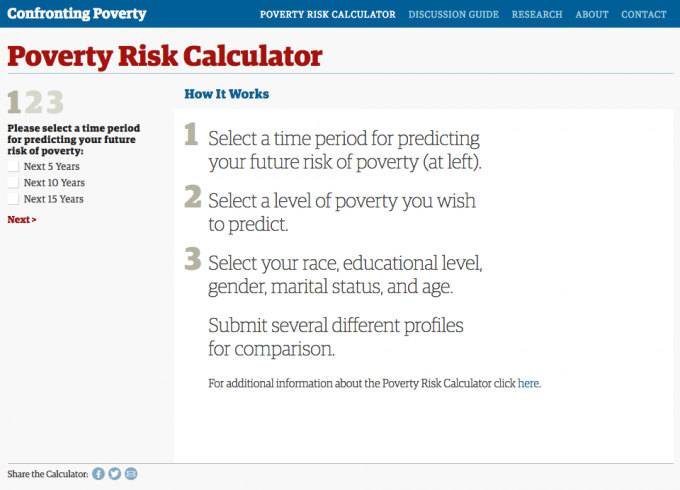 First, the poverty risk calculator allows users to engage first-hand with the research. It is one thing to report research findings to a wider audience, but quite another to enable them to use that research to directly inform their own lives. Using our calculator, individuals enter background information on five dimensions (age, race, gender, education, and marital status), and receive a 5-, 10-, and 15-year probability that they will experience at least one year of poverty during these time periods. Individuals can also calculate their odds of experiencing near-poverty (below 150 of the official poverty line), poverty (below 100 percent of the poverty line), and extreme poverty (below 50 percent of the poverty line). We believe that such personal access to our research findings can serve as a potentially empowering and enlightening experience. Second, the risk of poverty for many Americans is significant; seeing that allows them to begin to understand poverty as both a public and systemic issue. The calculator graphically displays their longitudinal probabilities so that the risk of impoverishment becomes visibly apparent. While the likelihood of poverty may be low during any single year, across multiple years, individuals observe that their risk can rise substantially, revealing the prevalence of U.S. poverty. As a result, citizens can begin to move away from the deeply held but incorrect idea that poverty is simply a personal failing. The accompanying discussion guide on our website explores various aspects of poverty and inequality and is designed for groups or individuals to explore the underlying causes of and possible solutions to endemic poverty. Third, the calculator is designed so that individuals can easily compare their profile with others’ to examine how the risk of poverty varies by different characteristics. The impact of each variable is profound, and one can readily see how poverty is affected by, for example, race or gender. In real-time, users observe the impact of key sociological dimensions on life chances. Finally, the website, along with its discussion guide and additional research components, is designed to encourage individuals to take action toward alleviating American poverty. The poverty risk calculator allows people to see into their future. However, that future is not a fait accompli. Individuals can begin to take both personal and collective/political action in order to reduce the extent of poverty in this country. The poverty risk calculator is a challenge and a warning that we must do better. Poverty affects us all, and therefore, we all must assume responsibility for addressing poverty. Interacting with the website creates a personal connection which, in turn, can motivate everyday citizens to become change agents. 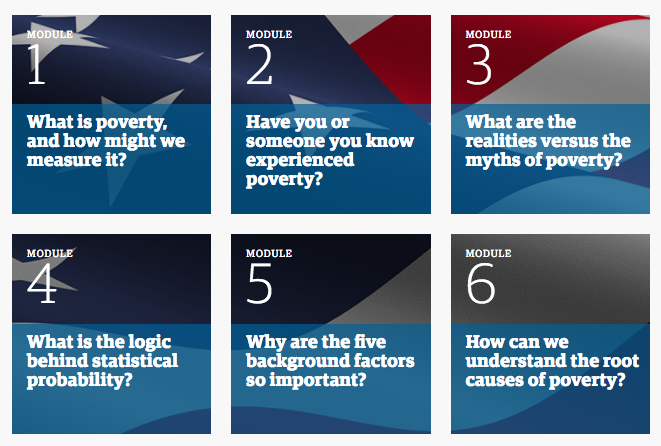 Confrontingpoverty.org makes ten different discussion modules available for students and teachers. To date, our website has garnered close to a million page views, with visitors hailing from over 180 countries around the globe. We plan to extend its use into a number of different settings including high school classrooms, university courses, and community and civic agencies. We also plan to expand the website and calculator in order to estimate the likelihood of other dimensions of economic distress, such as the chances of using a social safety net program, the probabilities of experiencing a spell of unemployment, and the likelihood of a significant drop in annual income. This information can help to map out the economic dangers that face many Americans and provides the knowledge and impetus to actively confront and alter that future. But this is just a beginning. There are countless examples where sociologists could extend their research into the public domain. Consider the work being conducted on economic mobility, family dynamics, mass incarceration, child development, residential segregation, glass ceilings, and on and on. Sociologists should begin to apply their sociological imaginations to consider how their research can be used to create societal change and betterment. For example, the Census Bureau allows users to engage with an interactive mapping program to examine population characteristics at the Census tract and block group level. Could we begin to transform this data such that users might analyze how changes in population characteristics within a neighborhood impact in real time upon other dimensions of a neighborhood’s well-being? The advances in geographic information system (GIS) and other mapping capabilities would appear ideal for taking research on neighborhood dynamics out into those neighborhoods. Sociology focuses on many of today’s most important and pressing problems. It is time for us to creatively think about extending our research beyond the academy and into a wider audience. The age of the Internet and Big Data provide exciting prospects for sociologists to become innovators. In short, it is time to begin changing the world, one website at a time. Mark R. Rank is the Herbert S. Hadley Professor of Social Welfare at Washington University in St. Louis, MO. The poverty risk calculator and website are at confrontingpoverty.org.